Hi, my name is Chad Grooms. I’ve been a part of the midwest music industry for over 18 years. Recently I began a music production web show called Jamnatomy, which you can check out at my website: http://www.chadgrooms.com/jamnatomy. But enough about me, let’s get started. 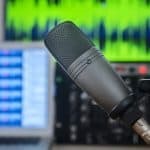 Question: Can you really create pro-level recordings at home, and on a tight budget? After years of curiosity, I finally booked studio time at a popular pro studio in Portland USA for a proper apples-to-apples comparison. 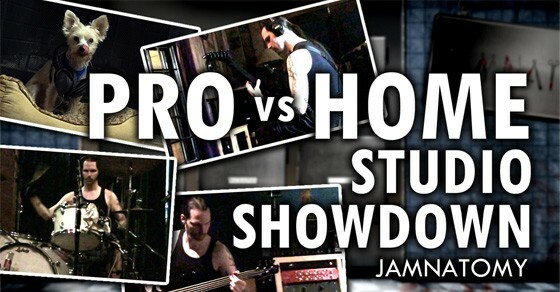 While Shaun’s other post on home vs pro studios looks at some theory behind when you should use each one, it doesn’t break it down like I have here or give audio examples of how each studio’s recordings came out. The total retail cost is $1,430 USD, including software. I am not including cost of cables, instruments, amps, or my computer for obvious reasons. I won’t be itemizing the pro studio, because it can be safely assumed that all recording equipment was top-quality. For a full comparison of the two recordings side by side though, please check the bottom of this guide. Now, let’s get into what happened and the results. I needed a music piece that showcased audio dynamics. Drums were written to drive the mood between the two sections of the piece, and guitar tones were chosen to expose glaring quality differences (if any) between the home & studio versions. Bass was written to simply carry the low end and play off the beat. I arrived at the studio with nothing more than my guitar, my bass, and an amp. The producer understood the goal of the project, and did his best to focus on sonic quality above all else. Thankfully, we had an intern on-site also, which sped the process along quite a bit. First up was drums, obviously. Setup, mic placement, and sound checks took about 2 hours. Considering that this is a weak point of many home recordings, I was happy to sit back and just let the producer take his time. Sadly, I wasn’t thrilled about the old 60’s Ludwig studio kit. It just wasn’t right for heavy rock, and since I didn’t have time to properly mute the bass drum, I knew that drum processing was going to be a nightmare. All that said, this is a sonic quality and clarity test, so for that reason it served its purpose and I went with it. Tracking drums only took about 30 minutes, which I was really happy about. I can’t reiterate enough that I play drums, but I’m NOT a drummer, so the performance was tolerable but not great. In fact, I accidentally rearranged the bass drum hits on the verse (heh, woops). But hey, it’s just an experiment, right? Next, I hopped into the control room and grabbed my bass. The producer ran me D.I. and used amp emulation to get a nice warm bass tone. Tracking took at most 10 minutes. Guitar was a bit more difficult. The studio had probably 10 amps, but most weren’t really what I was looking for tone-wise. We ended up settling on my VOX VT50 that I brought, with an Orange Holy Terror as an alternate. Once cranked, we were surprisingly happy with our tones and ended up recording two tracks from the VOX and one from the Orange. Finally, the producer gave me raw tracks for every microphone and source, and sent me on my way. In total, I believe I was working with 11 drum tracks, 6 guitar tracks, and 2 bass tracks. I know, I know…I would have loved to get the track mixed and mastered by the studio, but this was an out-of-pocket experiment, so work with me here. As soon as I got home, I popped open Cakewalk SONAR and imported the raw tracks. As I dug into the drums, I noticed that they had an upper-frequency crispness that was obviously superior to acoustic recordings that I’ve done at home. It wasn’t an extreme quality difference, though…just a little more clear. There was definitely a harsh boxiness and some excessive ringing due to the drum set, but aside from some additional processing to fix that, the drum mix came together just as any other mix I have done. The punch and polish slowly started to emerge as I processed each drum individually, and then the kit as a whole. After a few drum mixes, I was happy with the result and moved on to bass. This was comically easy because I was handed a pre-processed track. I simply threw on some EQ and light compression to match the song and called it done. Guitars were already processed as well, so I simply panned, threw on a hi/lo pass filter, and pulled out a few bad frequencies. The mix came together naturally. I imported that into a new project and fired up iZotope Ozone to master the track. I used a rock preset, lightly tweaked, and just like that, I was done with the studio track. Without a proper recording environment (read: I live in a town-home), my only drum option was my Roland TD-11kv electronic drum set and Superior Drummer for drum processing. Unless you have a treated room with a great set of drum mics, this is usually the best option at home. Obviously, you can program drums without an electronic kit, but the lack of natural human variation may cause the track to come across robotic and/or unrealistic, often even after “humanizing” the MIDI performance. I approached drum processing in the exact same way as the studio version. Using the Superior Drummer Avatar kit, I dug into each mic and EQ’d/compressed to my liking, and then processed the entire kit. I ended up with a much tighter drum sound here than the studio version, but the Superior Drummer kits are “best case scenarios,” so I don’t think that’s a big surprise. Bass was once again very straight-forward. I recorded one take, EQ’d to clean up the track, and used a parallel compression technique to thicken up the bass. That’s it. Guitars were more difficult than I expected. Initially, I tried to use my Boss GT-10 multi-effects processor to simply dial in a matching tone to the studio, but no matter what amp model I used and how I configured, The speaker/mic emulation just didn’t accurately reproduce the punch or break-up of the speaker. Rather than drag out the process by digging through countless emulation plugins, I mic’d the same amp that we used in the studio (VOX VT-50) with my own SM-57 and my MXL V63M condenser microphone. I couldn’t push the amp as hard as we did in the studio, but it didn’t take long to dial in some fairly close tones, so I went with it. The mixing and mastering process for the home recording was similar to the studio track, but I did find that I had to tweak a fair amount more to bring out the same thickness as the studio version. I attribute this to pre-amps used on the microphones for the guitars, and the ability to really crank the amps and push the tubes. 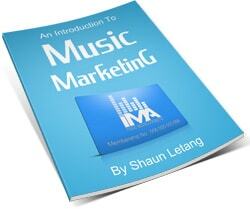 A quick thank you to Shaun Letang for giving me the opportunity to guest-post for MusicIndustryHowTo.com. If you want more great experiments and tips for producers, check out my site.